During our travels we see many odd, funny, exciting or wonderful things. On this page we share some of these with you. Keep looking (updates are at the top of the page). Photos are clickable for a closer view. 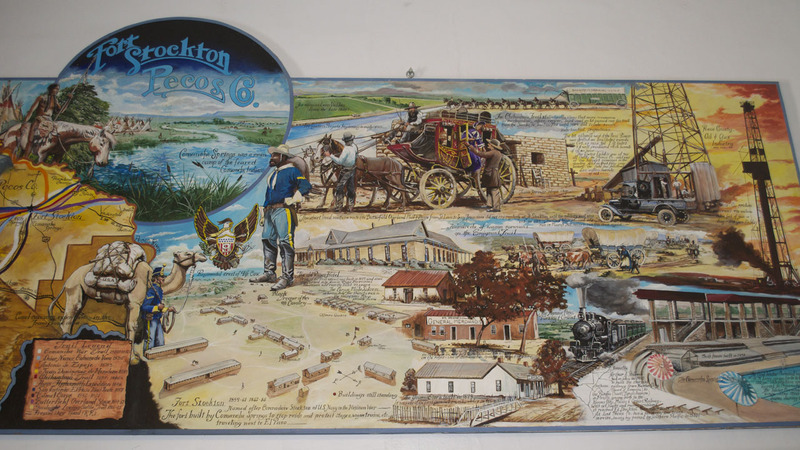 We wandered around historic Fort Stockton, Texas, for several hours, steeping ourselves in the history of the Comanche people, and the ‘Buffalo’ soldiers who were stationed there to protect the settlers moving west. The soldiers were black, having been freed to choose what to do following the Civil war. We also spent some time in Annie Riggs Hotel Museum – so reminiscent of our early settler days in Australia. Sauntering down Main Street we came upon a most unusual shop that sold almost any type of bric-a-brac, ornaments, furniture…you could wish to see. 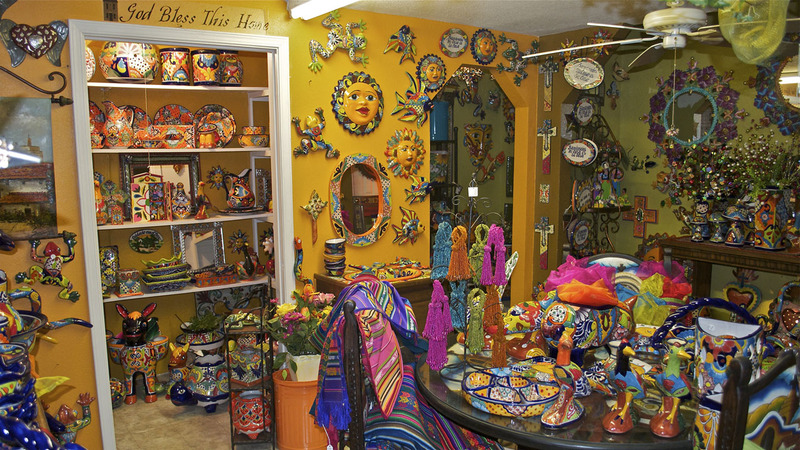 The shop was filled with brilliantly colored items of china, tin, metal, wood, fabric, plastic, and many other means of creating a display, the likes of which I’d never seen before. Fantastic! We’ve had the most exciting time the past two days. 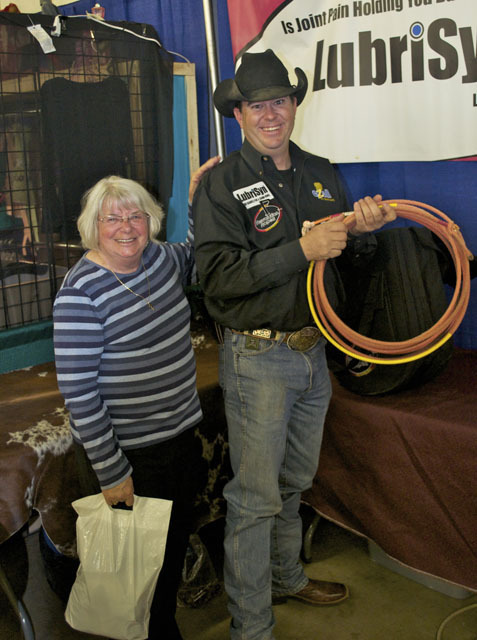 Check out the photo of me with a gentle Texas cowboy. There’s a story to come in the next few days with more action-packed photos. Keep watching! 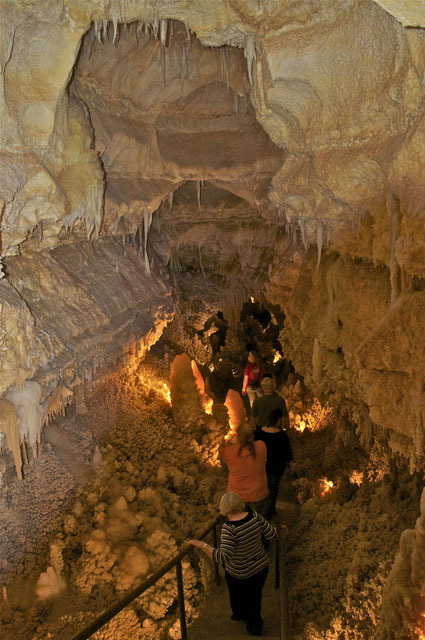 What an experience to go 150 feet underground into a magnificent world of stalactites and stalagmites, and other wonderful formations. I can’t describe the feeling of awe that seemed to sweep over all of us on the tour. The tour took an hour and three-quarters of climbing up and down approx. 300 steps. Tom and I usually were in the rear – Tom photographing – and me puffing!! I wasn’t going to reveal Tom’s Valentine gift to me, but I’ve had second thoughts. He spent $5 on what he thought was an expensive, pink lollypop. I looove lollypops! It was edible, but when flipped on the other side, it had a petrified scorpion embedded in the hardened sugar. 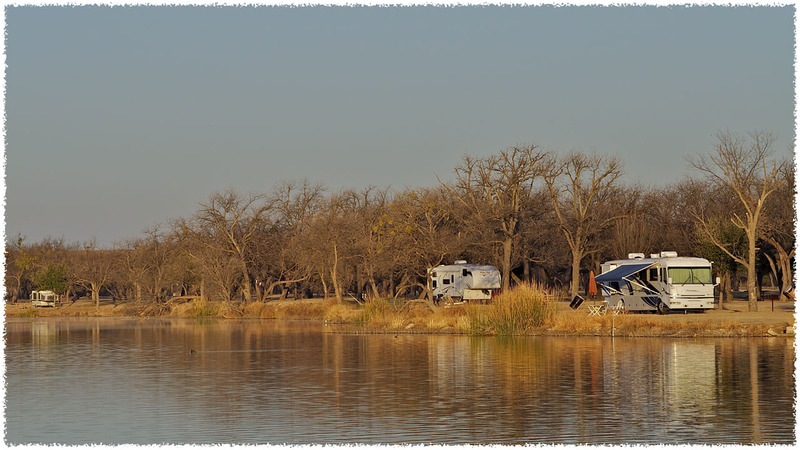 Our current RV park is by beautiful Nasworthy Lake in San Angelo, Texas. 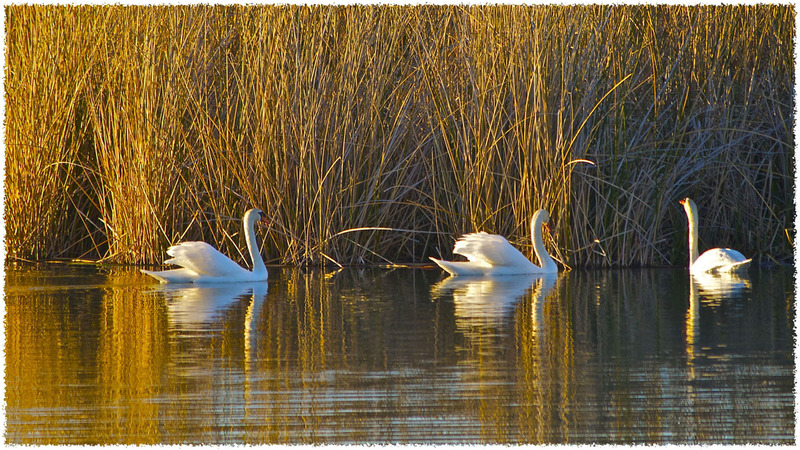 Coming home from a shopping trip, we saw some white swans – 2 males, 1 female. How did we know that? One swan was wearing himself out chasing off a ‘suitor’ and keeping a close eye on another swan that was feeding at her leisure in the reeds. Sleepy Hollow is a delightfully named road close by our RV park. We drove down to check out the waterfront homes around that part of the lake and came across lots of wild, bush turkeys and deer feeding in a clearing near their wild habitat. On entering our park, after returning from a sight-seeing tour, we stopped to let two small deer spring out of our way and race into the safety of the bush. Around the next corner, we saw a woodpecker, peck, peck, pecking on the side of a tree. We stopped the truck and watched it trying to get through the bark. Tom was excited when he saw an American chopper driving past our site. In an instant, he ran out of the RV, camera in hand, barefoot, and waved down the biker and passenger. Were they ready to draw their guns? 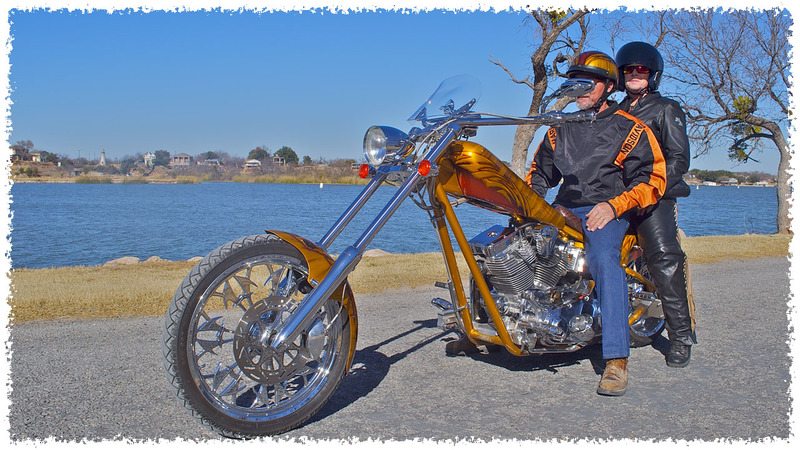 Close up, he realized it wasn’t a Harley, but it was enough for Tom to strike up a conversation. He returned happy. This is the view across the lake from our park. It was the week end and we were surprised to see several RVs and trailers enjoying relative solitude and especially, no fees, to spend a couple of nights there. Currently, we’re bunkered down for the freeze….Our fifth wheel pipes are frozen so no water….luckily we filled the kettle for coffee! After a few days we’re still frozen in. What to do? Go to a warm shopping center – Yes! Have a haircut, & shampoo – Yes! Try to unfreeze our frozen pipes – Yes! (for the nth. number of times). Slip and slide to the Bathhouse – Yes! Dreaming of sunny days and warm nights. – Yes! 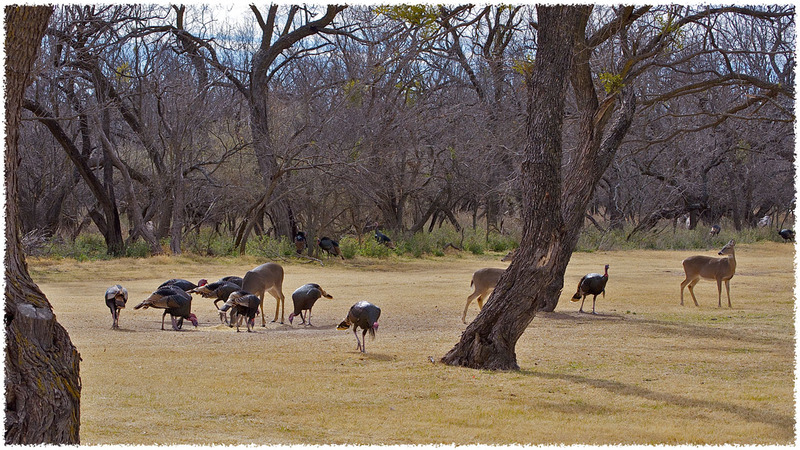 Since our last input, we have moved to Canyon Lake, Texas – reasonably close to both Austin and San Antonio. It’s in the hills area of Texas, where a sprinkling of snow can still occur. The RV Park – Lake Pointe – is very well appointed with adult + child swimming pools, library, computer room, activity room for planned programs, and all amenities. Very reasonable rates. Between our RV and the lake is a wilderness strip where a large number of deer lives. 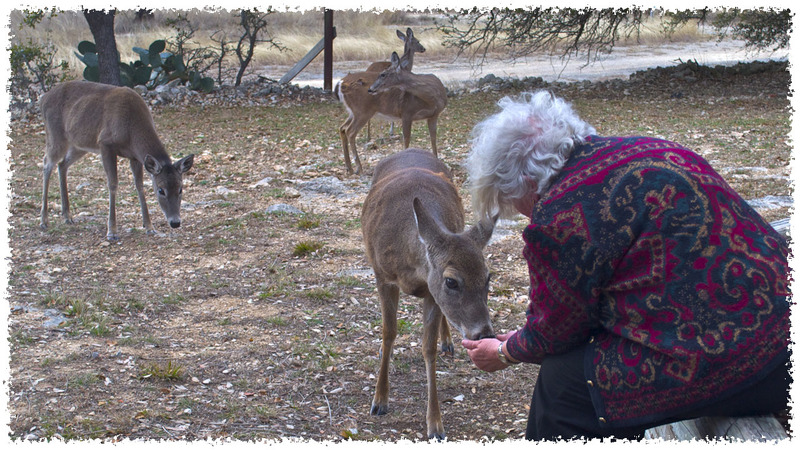 Once the nervous deer accept you, they’ll feed out of your hands. (photo below). 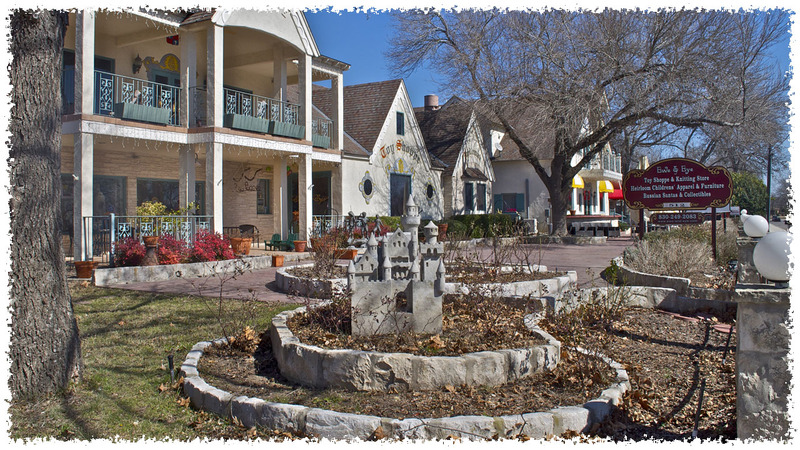 We drove into an old town, Boerne (pronounced Burnie), for a sightseeing tour. Early German settlers named many towns in the area. 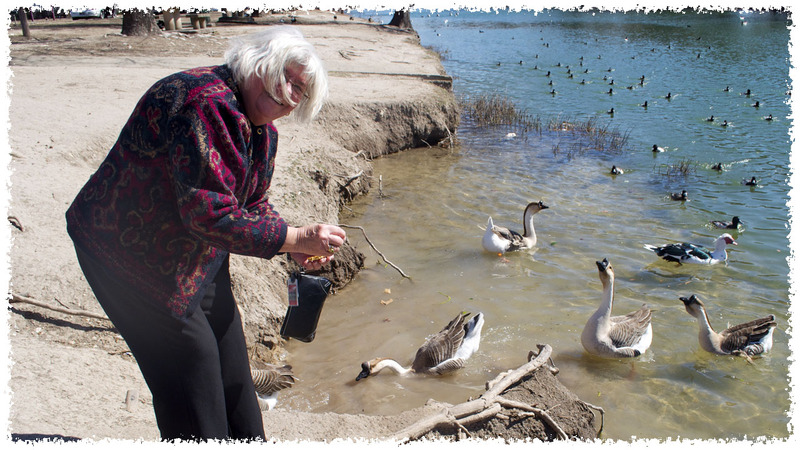 We parked by a river that flows through the town, population of 10 000 – with geese, farm ducks (AWOL), and wild ducks, living happily together, all vying for food from passers-by. (photo below). 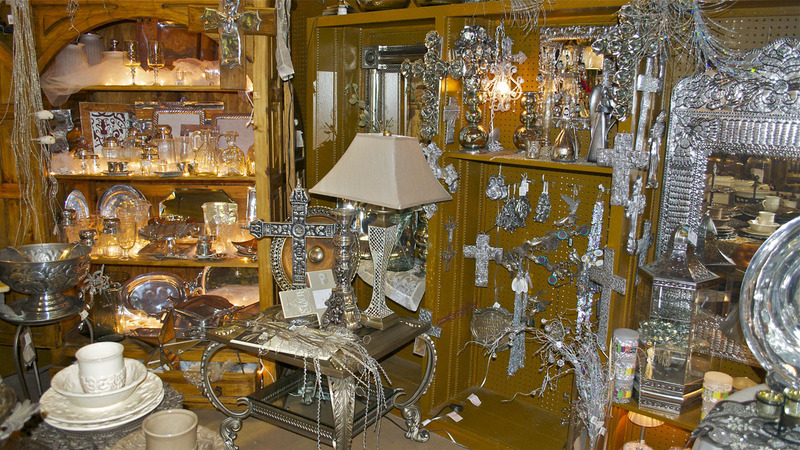 Collectibles – There are people in every society, all over the world who love to gather similar objects. Name an object and there’s probably someone collecting it. The RVing life style doesn’t necessarily exclude avid collectors from hunting and gathering. Our gentleman neighbor in a fifth wheel collects – light houses. A welcome banner on the edge of his site is emblazoned with a picture of a light-house. We note that inside, along one window, he has models of light-houses. As it’s impolite to stare through neighbours’ windows, we will have to assume that there are more. Once bitten with the bug, you can’t seem to stop. What are we collecting – photos; but they take up little space on a computer.